C. F. Martin 0-42 Model Flat Top Acoustic Guitar (1929), made in Nazareth, PA, serial # 39862, natural lacquer finish, spruce top, Brazillian rosewood back and sides, mahogany neck, ebony fingerboard, black hard shell case. In the pantheon of the world's greatest guitars the pearl-trimmed, 12-fret steel strung Martins of the late 1920s are well-represented, to say the least. In the late 1920s just before Martin altered nearly all their designs to the 14-fret neck "Orchestra Model" pattern, the company crafted a small number of their highest grade Style 42 and 45 instruments braced for steel strings instead of the gut used previously. 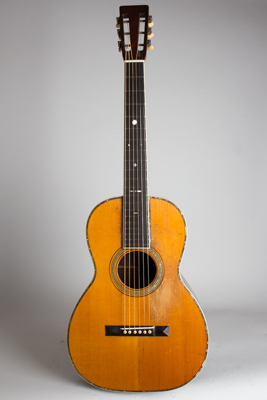 This 1929 0-42 is one of just 25 made that year, when this lovely pearl of a guitar sold for $105.00, which seems like a bargain even calculated in period money! The Style 42 was built of the finest materials Martin had available: superb straight-grained Brazilian rosewood, the tightest-grained Appalachian spruce for the top, and extravagant green-and-pinkish hued abalone for the border inlay. The size 0 was by this point the smallest of three models offered at the top quality level, and even though produced in the largest quantity of the three, it is still a very rare guitar. The pearl-trimmed Martins were never made in large batches, and it would be very unusual for any but the largest dealer to order more than one at a time, or even hold one in stock. Mostly they were built to order, and even in the opulent times of the late 1920s there were not a lot of guitar players that could afford one! This one has seen a lot of use but remains a wonderful playing and sounding instrument, a testament to its builder's skill and reputation and as fine a 12-fret 0-sized model as could be made. Overall length is 38 in. (96.5 cm. ), 13 5/8 in. (34.6 cm.) wide at lower bout, and 4 1/4 in. (10.8 cm.) in depth at side, taken at the end block. Scale length is 24 3/4 in. (629 mm.). Width of nut is 1 7/8 in. (48 mm.). This guitar is in fine playing condition, but well-used with a number of repairs both old and recent. The neck has been neatly reset and the fingerboard is a perfect replica fitted with the correct bar frets and using the original shaped pearl inlay. The original thin scalloped X-bracing on the top has been carefully reglued, with only the single long brace just under the fingerboard extension replaced with a replica brace. The top shows several old crack repairs behind the bridge, with one long splice on the center seam. There are a couple of small tight grain cracks on the top in the upper bass bout area. The bridge and bridgeplate are original and have been reglued over time; the bridge was lowered just a touch long ago and has a newer saddle. The guitar shows dents, scrapes, and wear to the finish overall -- most notably to the top under the sound hole -- but remains in nicely original condition with no oversprayed finish or added elements like a pickguard. There is some slight disturbance around the bridge from being reglued, but no large loss or pulled-up spruce. The back of the neck is worn down to the wood over much of its length and feels perfectly played-in. A superb guitar to play, and a wonderful and rare old Martin from the perfect year for the 12-fret top-end guitars. Excellent - Condition. Click on a thumbnail above for a detailed view. and may not be reproduced without permission. Visit our companion site, Retrofret.com, dedicated to vintage guitars and fretted instruments. Our selection of historical musically themed images. Link to instruments with audio samples. View some of our recently sold items.